Metro Transit makes it easy to enjoy a Friday night movie in Forest Park this summer. The #3 Forest Park Trolley will operate free, special trips after 7 p.m. between the Forest Park-DeBaliviere MetroLink Station and Art Hill on four Friday evenings – July 13, July 20, July 27 and August 3 – for the Saint Louis Art Museum’s Art Hill Film Series. The first movie in the lineup is Raiders of the Lost Ark on Friday, July 13. 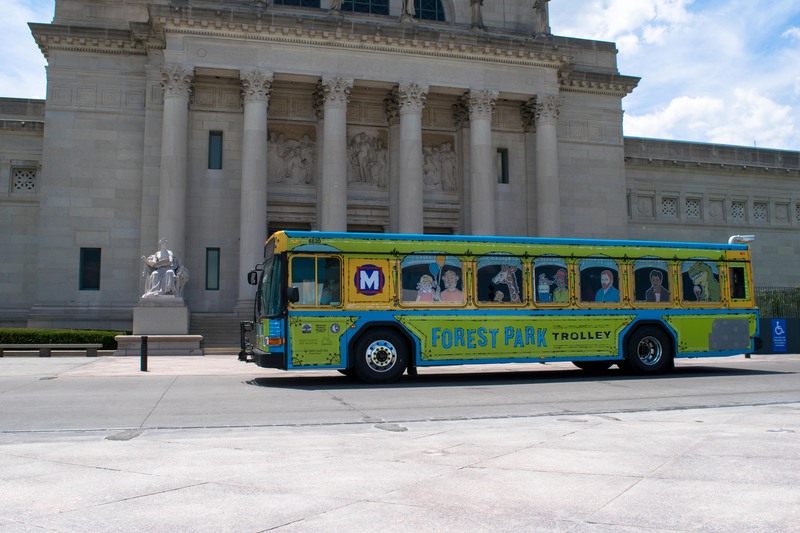 Park at any one of the 21 free Metro Park-Ride lots in Missouri and Illinois, ride MetroLink to the Forest Park-DeBaliviere MetroLink Station, and hop on the #3 Forest Park Trolley after 7 p.m. for a free ride to Art Hill. The Trolley will operate every 30 minutes between 7:20 p.m. and 9 p.m. on July 13, July 20, July 27 and August 3. The Trolley will provide return trips every 30 minutes from the Saint Louis Art Museum to the Forest Park-DeBaliviere Station starting at 10 p.m. on July 13; 9:50 p.m. on July 20; 9:56 p.m. on July 27; and 10:06 p.m. on August 3. The #3 Forest Park Trolley provides daily service to the Forest Park-DeBaliviere MetroLink Station and all of the popular attractions in Forest Park. This year, the Forest Park Trolley is free to ride on Sundays. The Trolley operates through September 3, 2018, from 9 a.m. to 7 p.m. To plan your trip on the #3 Forest Park Trolley, visit metrostlouis.org or contact Metro Transit Information, available Monday through Friday from 7 a.m. to 6 p.m. at 314-231-2345 or 618-271-2345.